Winter in Chicago calls for hearty, warm comfort dishes. I'm an eater, but nobody wants to eat crock pot stews and chili for six straight months. Because we tend to use pork and turkey tenderloins in the crockpot quite often. This time I wanted to roast the pork with crusty strong flavors Searing the pork before putting it in the oven gives it a nice outside crust. Adding the horseradish and mustard on top completes it. The toppings drip down into the pan and mixes with the broth for a simple sauce. It's not an abundant amount of sauce - but enough. It's still stew-esque, hearty and comforting - but with a tangy zip to keep you fat and happy! Season pork with salt seasoning salt and pepper, quickly sear over medium/high heat on all sides. Remove meat, set aside. 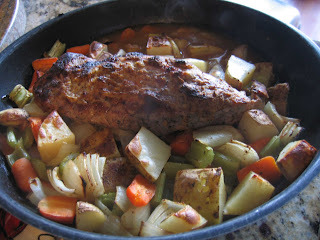 Place the pork tenderloin back in the pan. Spoon creamy horseradish over the pork first, then a grainy mustard second. Be generous! Allow some of these to seep down the sides of the pork to help flavor the broth and veggies. Cover pan loosely with foil, place in the oven and bake at 350 for 1/2 hour (internal temp should be about 155 degrees at this point. Turn on the broiler, Uncover and broil until the the pork is slightly crusting and the veggies begin to show browning. (Final pork temperature should be at165 degrees) Remove from heat and let the pork rest for 10 minutes. If you find the pork is done but the potatoes are too hard, take the meat out of the pan and leave the veggies in the oven for a few more minutes; don't overcook the spuds- you want the ever slightest hardness to them, not mushy. Slice, serve with veggies and a little spoon of sauce.